Five years ago today, I started writing about craft beer. I'm not entirely sure what drove me to do it, other than a growing fascination with better beer and the idea that I might have something to say about it. That's not to suggest I had any clue how to say it, given that I don't have any formal training as a writer, but (for better or worse) Examiner was the kind of place that didn't worry much about details like that, so all it took was a short application to get me started on my way. Looking back, the timing of my decision wasn't ideal, especially when you consider how little there was to write about in the summer of 2010. There were only a handful of brewing operations, and to suggest that craft beer-related events were virtually non-existent would be an understatement to say the least. Combine that with my considerable lack of experience, and it's not hard to understand why my expectations for having any sort of success in this endeavor were minuscule at best. Truth be told, I figured this little experiment would last no more than six months. Yet, here we are five years later. The local scene has grown by leaps and bounds, and at least for now it's showing no signs of letting up. There's no way to cover everything that's changed, but just for fun here's a glimpse into the differences in a few key areas. Five years ago today, Franconia and Rahr & Sons were the only two production breweries in North Texas. Franconia had only been open two years, while Rahr & Sons had just re-started production after Snowmageddon, otherwise known as the infamous February 2010 roof collapse. There were some brewpubs as well, namely Humperdinks, Uncle Buck's and both Gordon Biersch franchises, not to mention The Covey which would close just two months later. Today, North Texas has 32 breweries and a dozen brewpubs, with operations located in 22 different cities. Take into account another ten or so said to be in development, and it stands to reason we'll see an increase in each of those numbers over the course of the next 12-18 months. Five years ago today, we'd never heard of Untapped, there was no Big Texas Beer Fest, and we'd yet to experience our first North Texas Beer Week. In fact, a look at my first ever events post from August 3, 2010 shows that entertainment options were few and far between. Not counting the two brewery tours, I listed a grand total of seven events for that week, two of which arguably had nothing to do with craft beer. August 3, 2010 event listing, originally posted on Examiner.com. Today, a dozen events happen on any given day, and not a month goes by between April and November when we don't have at least one large-scale beer festival. One of these, the Best Little Brewfest in Texas, donates all of its proceeds to charity and has raised nearly $200,000 for organizations in the community. As for North Texas Beer Week, that's gone from humble beginnings (and once being called Dallas Beer Week) to an event that boasts hundreds of events over a ten day period which occur all across the Metroplex. As the above image will attest, there weren't a lot of places to enjoy a craft beer outside of the comfort of your own home in 2010. Among them, the Ginger Man in Dallas and area Flying Saucer locations had been the most likely destinations for years. Sure, there were other places to enjoy a cold one, but prior to the craft beer boom, members of the old guard like Trinity Hall, The Old Monk and The Londoner catered to a more European sensibility. In terms of names we're all familiar with, five years ago today the Holy Grail Pub in Plano had been around for less than a year, while the Meddlesome Moth had been open for three months, and The Common Table for only two. Restaurants, as a rule, didn't carry much in the way of craft beer and you certainly weren't going to be drinking anything other than "big beer" at the ballgame. Today, a typical weekly event listing contains over 50 different venues that cater to the craft beer crowd. Restaurants boast about "craft beer programs," with the one we know as LUCK going so far as to stock nothing but locally-brewed beer. Beyond that, you can pound pints while picking up groceries, grab growlers to take home, and drink Roughrider Red, a craft beer you'll only find at a local minor league ballgame. And, breweries? Many have a taproom, and there are enough of them now that you can stop for a beer at the source on any night of the week. Five years ago today, no North Texas brewery had ever won a medal at the Great American Beer Festival (GABF), while Rahr & Sons was the only one to ever place at the World Beer Cup (WBC). Brewpubs enjoyed some success at both going back to the 1990s, but even that was tempered by the pending closure of The Covey after winning five medals combined since 2008. That all changed in 2012 when Peticolas and Rahr & Sons ended the drought with gold and silver medals, respectively, at the GABF. After that, Armadillo Ale Works (2014, GABF), Cedar Creek (2013, GABF), Deep Ellum (2014, WBC) and Grapevine (2014, GABF) all joined the party, while the spirit of The Covey lived on after founder Jamie Fulton joined up with Community and went right back to his winning ways (2013-14, GABF and 2014, WBC). 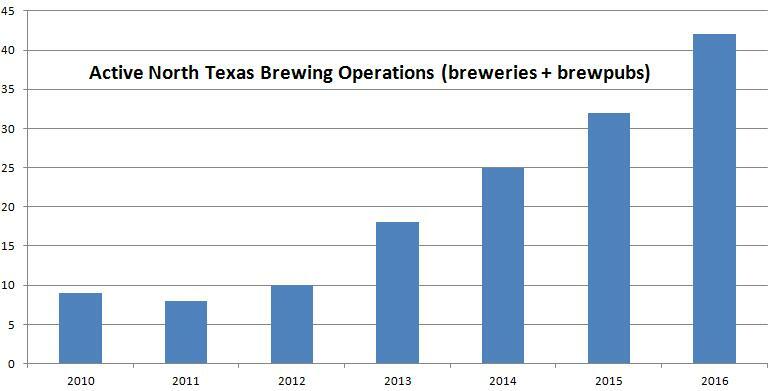 Suffice it to say, the North Texas beer scene looks a whole lot better today than it did in August 2010. As for how things will look in another five years, only time will tell. For now, all we can do is enjoy the ride for as long as it lasts. And, on that note, let me say that covering the craft beer scene for the last five years has been a ride all its own. Some of my favorite memories include meeting would-be brewers in parking lots, homebrew shops and the like for a taste of test batches that have gone on to become iconic North Texas brews, not to mention getting the opportunity to see many local breweries be built from the ground up. Of course, there's also that one time I decided to mess with Dennis Wehrmann and wear a Shiner t-shirt to Franconia's Saturday tour. In any case, the fact that I'm still around is a testament to the welcoming nature of the local brewing community and to those that visit this page to take time to read an article or to check in on a weekly events. For that I offer my thanks to both brewers and readers alike. Viva DFW beer scene! It's a great time to be a beer fan. Should Taste Test be taken to task?